The Borja Family: Green Donuts with "Sparkles"
Timothy woke up yesterday with green donuts on his mind. 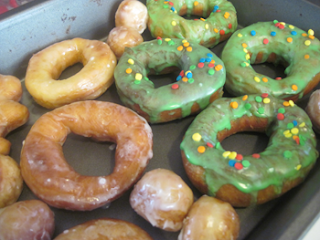 I have no idea where to buy green glazed donuts if it's not St. Patricks Day. It was Friday, the housework was done and we had some time to kill. 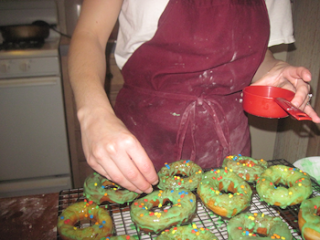 So green donuts with "sparkles"....sprinkles...was definitely on the menu. 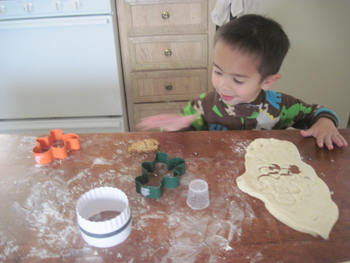 I let Timothy roll and cut out the left over dough. He made a "gingerbread donut man". 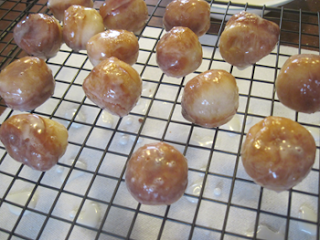 I LOVE donut holes! So yummy! Just out of the oil and ready for their green bath. Tim likes to photograph me while I cook. Not bad for a 3 year old. All glazed and ready to share with Uncle Brad. Timothy called my Dad in Georgia and asked him if he wanted to get in his airplane and come have donuts at Nana's house. I'm not sure Grandpa Jeff even understood him- he was so excited it all came out so quickly. 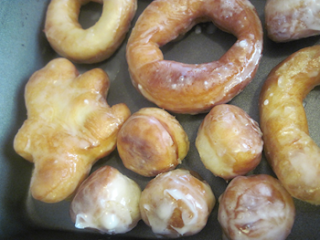 Here is the "gingerbread donut man" made by Mr. Timmy. Yeast raised donuts take over 2 hours to make but we got to spend some time together and it re-instilled in his mind that -In case you ever wonder, I am the BEST MOM EVER. Love me while I'm still considered cool, you rapidly growing boy. 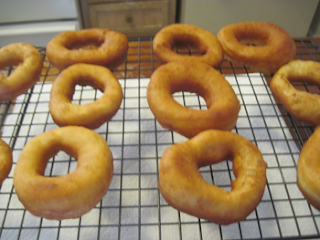 RECIPE WE USED CAN BE FOUND HERE.